Prove Your Site is Trustworthy. Skyrocket Your Profits. iWebTrust.com helps websites gain massive trust from their customers by using trust badges. Display our trust badges with a simple line of code and watch your profits soar. Start your trial today. We're in an age where anyone can create a website and easily accept credit cards. As a result, buyer skepticism is at an all time high. The majority of website visitors no longer trust a website without third-party verification. According to a recent study, up to 90% of online shoppers rely on recommendations before making any sort of purchase decision. Without buyer confidence, customers are visiting your site and abruptly leaving. A recent case study by VWO.com proved that a trust badge increases conversions by 72.05%. A badge can be installed in seconds. Picture almost doubling your sales by adding one simple line of code. 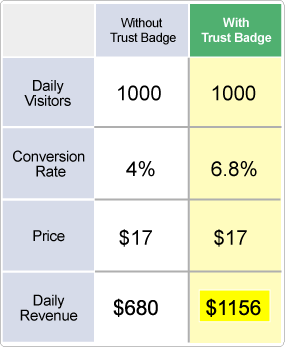 The above graph illustrates how a single trust badge can bring a 72.05% increase in conversion rate - dramatically increasing revenue. The above chart illustrates the dramatic revenue increase after adding a trust badge. Imagine you own a site that receives 1000 visits a day, sells a product for $17, and converts 4% of its visitors into sales. With these numbers, this website would have a daily revenue of $680. You then decide to add a trust badge. A 72.05% increase (added to 4%) results in a 6.8% conversion rate. At at 6.8% conversion rate, you'd have a revenue of $1156. That is an increase of $476 per day and $173,740 per year. We cannot promise your revenue will increase this dramatically, but there's not an easier, simpler, more cost-effective way to increase conversions. And our trust badge is a risk-free free trial -- try it on your site today. iWebTrust is a simple service that verifies elements of your business. It then displays these qualties on your site as trust seals. As mentioned above, a study recently showed a 72% increase in conversions with the use of a trust badge/seal. 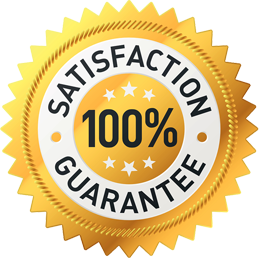 Add our simple seal to your site and watch your sales automatically skyrocket. Installation is simple. Just enter the small line of code within your website, and the badge will appear on your site. If you cannot do it, we can add the code for you. The more trust, the more sales. The more sales, the more revenue to spend on advertising. Every piece of leverage helps to dominate your market. 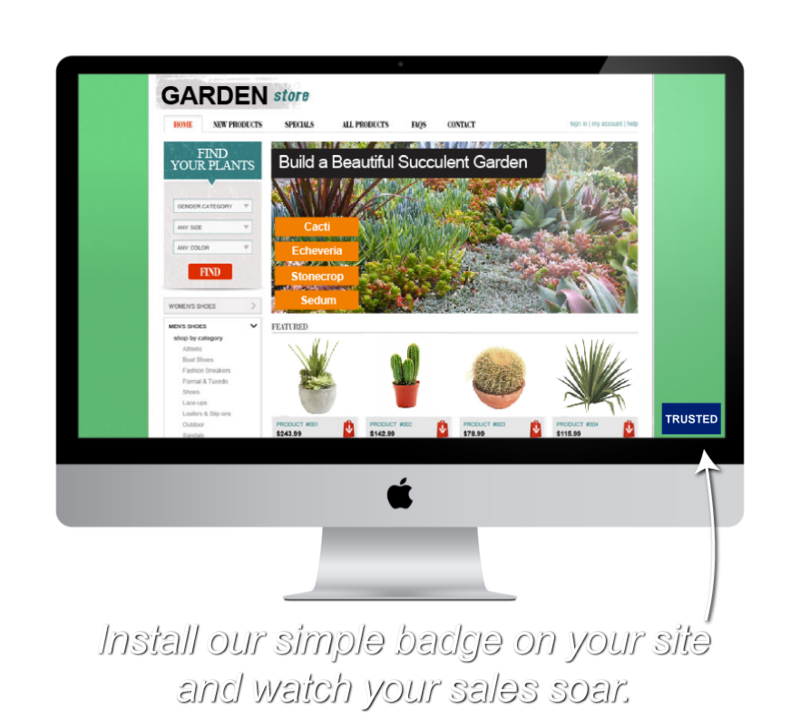 Display three badges on your website to address different areas of customer skepticism. Choose from a variety of badges to match your website. The badges can be in a static position, float in the browser window, or both. Our Trusted Seller Badge shows your visitors that your business credentials are verified and true. This includes the verified email address, mailing address, phone number, and more. Our Verified Privacy Badge shows your visitors that your website is compliant to CAN-SPAM Act of 2003, does not conduct SPAM, does not sell customer information, and keeps customer information safe from spam, spyware and viruses. Our Safe Website Badge show your visitors that your website has an SSL order page and that information transmitted is encrypted. This helps them feel from scams, hackers, credit card fraud, and identity theft. Our sign up process is quick and easy. Simply fill out our brief application and we'll begin our review of your website. We usually approve a site in 24 hours. Our trust badge can be installed in under five minutes. You sign up for our service for the small fee of $29/month. Your credit card is not charged unless you're accepted and 30 days has elapsed. You fill out a brief form that asks for a few pieces of information such as your business contact information, email address, date of inception, etc. We review your submitted information using our proprietary verification process to ensure that your business is in good standing. If you pass our manual review, we award you with an email that includes the trust badge code to install on your site. Installation is incredibly easy. The code is active on your site! You begin enjoying the benefits of a highly-trusted business: more confident buyers and higher profits. iWebTrust can work as an intermediary to resolve any issues between you and the customer. This will work in reducing the chances of negative feedback about your business. Our seal helps address common customer concerns: Can I trust this website? Is the product safe? Will my personal information be secure? Because we work between you and your customer, we can contact you as soon as customer complains. This can dramatically reduce chargebacks. Our product is incredibly easy to install and requires no maintenance. However if you need help with anything, we’re here to help. The trust of our badge will give you a unique selling proposition, making your business stand out from the rest. Trying our product is totally risk-free. Test it out and watch your website’s conversions increase. Cancel it any time. You will go through an approval process after applying. We only allow qualified businesses to use our service. We do not want our trust badge misleading customers by displaying on a dishonest site. Because they are virtually unknown, many new, lesser known websites struggle with establishing customer trust. The quickest and easiest solution is implement a trust seal. And the lesser known the website, the better trust seals work. Is my information safe from being intercepted? Is this site free of hackers? Will this site sell my information or SPAM me? A badge that clearly states the hosted domain and date of validity. A certificate that shows when the badge is clicked. We tried out your badge on our site and saw conversions increase almost immediately. A lot of sites are not trusted, especially for digital products, and this helped people get a little faith in us. Thanks. We needed something to give us an edge on the competition. We had a great site, and a great product, but no testimonials. Your helped us in our early days, and we still use it to this day. I never want to cancel it. After the first month has elapsed, you will be billed $29 per month. If your conversions have not increased by the 2nd month, we will cancel your subscription and credit you with a refund no questions asked.